Councilmembers are considering electing Lynette Gibson McElhaney as their next president, despite the fact that she's been plagued by scandal. The year 2015 offers a lot of hope for the City of Oakland. On Monday, January 5, Libby Schaaf — who won the 2014 mayor's race by a wide margin, is generating excitement about Oakland, and has widespread support throughout the city — will be sworn into office. Two new councilmembers — Abel Guillen and Annie Campbell Washington — will take their seats on the dais. And three new school board members — Aimee Eng, Nina Senn, and Shanthi Gonzales — will launch their efforts to turn around Oakland's public school system. The city council, however, may be poised to dampen the city's prospects for the next two years: Sources have told the Express that councilmembers are considering electing Lynette Gibson McElhaney as their next council president. 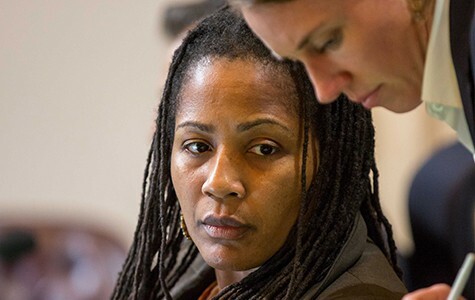 The job of city council president is an important leadership position in Oakland — and arguably the second most powerful one after the mayor — but Gibson McElhaney has shown that, while she appears to be a very nice person and an intelligent and caring public official, she's not up for the job. 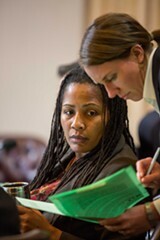 Her involvement in a house-flipping scheme in Oakland at a time when she was also speechifying about the evils of gentrification, displacement, and real estate profiteering, displayed an alarming level of hypocrisy (see "West Oakland Councilmember Involved in House-Flipping Scheme," 12/17). Her failure to pay hundreds of thousands of dollars in federal and state taxes in 2006, 2008, 2009, 2011, and 2012 also raises red flags about her ability to handle finances, and is especially problematic considering that, as council president, she would preside over Oakland's $1 billion annual budget. Gibson McElhaney's decision to use her nonprofit to go into business with people who have troubling backgrounds also raises questions about her judgment. In this week's edition of the Express, investigative reporters Darwin BondGraham and Ali Winston reveal that Gibson McElhaney's nonprofit signed a real estate partnership deal with one of her city council campaign donors — Kevin L. Hampton — despite the fact that he was convicted of forgery in the 1990s, according to records from the Nevada Department of Corrections. In their December 17 cover story, BondGraham and Winston also revealed that Gibson McElhaney's nonprofit engaged in house-flipping deals with Richard Reese, a real estate investor who had been sued multiple times over the years on allegations of preying on and defrauding East Bay homeowners. It's also troubling that Gibson McElhaney's sister, Andrea Gibson Nobles, profited from a house-flipping deal in which the councilmember's nonprofit also made money. BondGraham and Winston also divulge this week that Gibson McElhaney failed to file her major campaign donor reports in 2014 in violation of city and state laws (see "Councilmember Fails to File Campaign Reports," on page 12). It goes without saying that council presidents (and all elected public officials, for that matter) should lead by example, follow the law, and pay their taxes. As such, Gibson McElhaney is not the right choice to be the council's next president. So who would be? Two current councilmembers stand out: Rebecca Kaplan and Dan Kalb. Kaplan obviously has the backing of many Oakland residents, having finished second in the 2014 mayor's race (and third in 2010). She also appears to be ready for the leadership position, and would provide the council and the city with a progressive, pro-environment voice. And Kalb is coming off an extremely successful year on the council — perhaps one of the best years a councilmember has had in recent memory. He spearheaded two tenant protection laws approved by the council in 2014 and pushed hard for the state's new kill switch law. In addition, he sponsored two good government ballot measures that were approved overwhelmingly by Oakland voters — Measure CC, which strengthens the city's Public Ethics Commission, and Measure DD, which creates an independent redistricting commission. In fact, Kalb would be a good choice for council president because he is the fiercest advocate on the council for open and transparent government and for public officials maintaining high ethical standards. Moreover, one of the first actions of the Kalb-strengthened Public Ethics Commission could be an investigation into Gibson McElhaney's failure to file her 2014 campaign finance report as required by law (which is yet another reason why Gibson McElhaney should not become council president). Yes, Jean Quan made numerous mistakes during her four years as mayor of Oakland and was never a good spokesperson for the city. But she deserves appreciation for the amount of passion and hard work she put into the job. In fact, there was never a question as to whether Quan's heart was in the right place: It was. She was the hardest working mayor that Oakland has had in decades. And there was never any doubt that she absolutely loved her city. Quan also was subjected to an unfair level of media scrutiny, especially from the San Francisco Chronicle and Bay Area TV stations. Journalists who didn't like her progressive politics — or didn't like her personally — seemed to delight in pointing out her every misstep, no matter how inconsequential. The media barrage also created a negative feedback loop, in which Quan overreacted to news stories and then exaggerated her accomplishments, which then would spur a whole new round of negativity. It was truly an unfortunate situation, and it obscured her achievements. She hired a good police chief, Sean Whent; most violent crime was down in 2014; she was instrumental in the launch of the massive Oakland Army Base redevelopment; and she secured the private funding needed to build the huge Brooklyn Basin housing development on the city's waterfront. Quan, in short, was a pretty good mayor — certainly much better than she was portrayed in the mainstream press. And she deserves a heartfelt thanks.